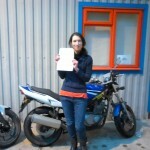 Now Louise Kendall-Brown is ready to ride the roads of Kent having passed her A2 with us this week. Well done Louise, it’s been a bit of a journey one way and another, but it worked well taking your time and getting a pass with just 1 minor!!! Excellent to see you there with your full motorbike licence certificate. Watch out Tunbridge Wells there’s gooing to be some celebrations going on I should think!